Or Does Your Business Own You? I can’t find any good help. My business is stuck and I don’t know what to do next. I don’t think I’ll ever be able to stop working and retire. I wish I could pay myself what I’m worth and make more money. How can I get my business to work without me doing all the work. If you have, you need to rethink how you’re running your company and start focusing on growing, making money and doing what you want. - Your business isn’t working! The answer is simple too! cogs that work together to make your company’s performance both predictable and profitable, over and over again, without you having to control and micromanage everything and everyone..
Want to find out how to fix your problems? Want to build your perfect business? George Hedley, entrepreneur and business building expert has written the step by step system to help business owners take their companies to the next level in any economy. 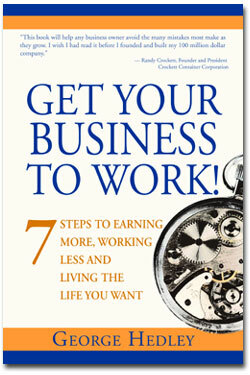 This best-selling book is the perfect solution to show you how to stop working so hard and get your business to work the way you want it to without you doing all the work! Learn how you can receive George’s FREE gifts when you order NOW!